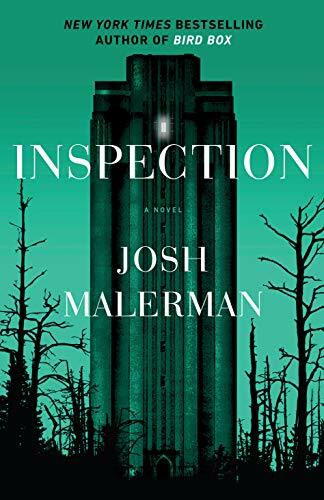 Wild concept meets richly imagined narrative in Josh Malerman’s Inspection, a novel that contemplates a dark experiment aimed at improving intelligence by separating boys from girls. If boys and girls can be reared without distractions, the theory goes, then each group will have more time to develop their genius. Both groups must not encounter or interact with the other. In fact, each group must not learn of the other’s existence; never shall the twain meet! Or it’s trouble. Serious trouble. The scientists mean business. Daily inspections—physical and verbal—are necessary to check that each group has remained unaware of the other. Around this notion, Malerman (Bird Box, Unbury Carol) has built a detailed, fully realized world—turrets, Mister Tree, Alphabet Boys, Letter Girls, The Corner, The Parenthood, D.A.D., M.O.M., The Glasgow Tunnel, The Body Hall, Effigy Meets, an odd mind game called Boats, and more. There is a Hogwartsian flavor as Malerman shows us around and explains how this closed-up world works. At the outset, the main point of view is one of the Alphabet Boys, J. But we are also given the dark-minded scientists and the writers who crank out books that reinforce the false narrative under which each camp is run. We are deep in the dark woods of northern Michigan, but the laboratory is disconnected from the outside world. This is all the Alphabet Boys and the Letter Girls know. After a thorough introduction to the boys’ side of things, Malerman gives us the perspective of Letter Girl K. It’s hard to imagine a reader who wouldn’t surmise that J and K belong together and that the scientists’ brash experiment will soon collapse. Perhaps it all would have worked better if the boys were in Michigan, say, and the girls were in Mississippi. As Inspection begins, the children in both camps are in their “Delicate Years.” The implication is clear: puberty is nigh. Stuff happens. Curiosity, you know. There is one plot point that should make for an excellent Hunger Games-style action scene when the movie is made (and Inspection seems tailor-made for film). It’s this: if K is standing in for all these bright girls and J is standing in for all these smart boys, it’s the female of the species who figures things out more quickly and works with a lot more tenacity to trigger the inevitable uprising. She’s a bright and special K.
“B looked to K, and in that moment both felt a seed rattle somewhere inside their bodies; perhaps this experience had the potential to grow into something bigger than either had planned on. How the children were first rounded up requires a leap, and it’s a bit of a head-scratcher that a giant laboratory in the woods—several miles of forest separate the two camps—has somehow gone unnoticed for a dozen years or more. Minor leaps. Check your own talents for close inspection at the door and go for an entertaining ride. Malerman’s world-building is rich, and Inspection’s quick chapters and brisk style make for a relentless, twisty read. Mark Stevens' most recent mystery is The Melancholy Howl (An Allison Coil Mystery). He has also been a journalist for several large newspapers and a producer for the MacNeil/Lehrer NewsHour.